If you’re making a media server out of a Raspberry Pi, why not add an interface to the biggest torrent sites on the Internet? That’s what [Alan] did when he wanted an automated media downloader that can stream movies and TV shows to any device. [Alan]’s torrent box is basically a web app running on a Raspberry Pi. By accessing the Pi from the browser of a desktop or mobile device, he can search a collection of torrent sites and download just about everything to the Pi with a touch of a button. Once the files are downloaded, the Pi is able to move them to any directory, either locally or on a network, or just serve them up on a TV with a media player. While we’re not endorsing file sharing, we can’t think of a simpler way to set up a seedbox that draws a minuscule amount of power. It’s a great addition to any media server, and a great way to get the latest season of <<Linux Distribution>> streaming to your TV. The latest version of the world’s most popular Linux distribution is now available. Ubuntu 9.10 Karmic Koala continues the six-month development cycle of this free OS. We’ve used Ubuntu since 2005 and, after a short adjustment period, never looked back at those other operating systems. Never used Linux? This distribution is for you but we recommend waiting until the release makes it out of beta to the stable version on October 29th. Comfortable with Linux and want to get your feet wet? The Hack a Day team is calling on all of you to test, report, and improve upon this community driven project. Get yourself a copy of the beta (we recommend using the torrents) and start reporting bugs. You can help fix them by joining the bug squad, or use your coding skills to become a developer. AndroidAndMe is running a bounty program for Android applications. Users can request a specific application and pledge money to be awarded to the developer who delivers the functional app. [Alec Holmes] just fulfilled the first request by creating Torrent Droid. You can use the app to scan media barcodes and then download the related torrent. It uses the phone’s camera to capture the product’s UPC barcode (similar to Compare Everywhere‘s price lookup) and then searches major torrent sites like The Pirate Bay to find a copy that can be downloaded. After getting the .torrent file, the app can submit it to uTorrent‘s web interface for remote downloading. The app will be released later this month and you can see a screenshot tour of it on Alec’s blog. It’s doubtful that an application like this would ever clear Apple’s App Store approval process. 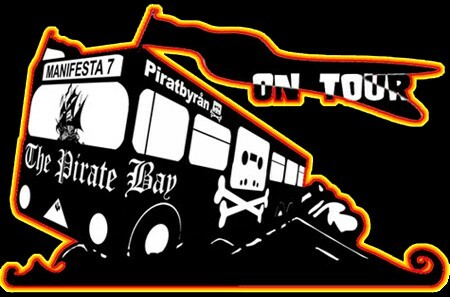 Piratbyrån and their hearties from The Pirate Bay are on a pan-European summer journey that will end at the Manifesta art biennial in Italy, but in the meantime they’ve been hard at work lobbying for total network encryption, a system that would protect users of a network (say, a P2P network) from deep packet inspection and other forms of activity analysis. The system by which this will be achieved is called IPETEE, and it works by replacing the basic operating system network stack and doing all encryption and decryption itself. More details can be found in the IPETEE technical proposal. Ars Technica pointed out numerous holes in the scheme, noting that most torrent apps already have encryption options. IPETEE applies to more than just torrents, though, so the larger problem is that encrypted packet still need source and destination IP addresses, meaning that one of the most crucial things you’d want to keep private (your destination site) is still accessible.